I put up a little something about WrestleMania III the other day, and that sparked a comments discussion about the WWE vs. TNA. If you're interested in wrestling, you'll want to click over and check out that thread. I don't know anything about TNA wrestling, but I do remember Rowdy Roddy Piper. 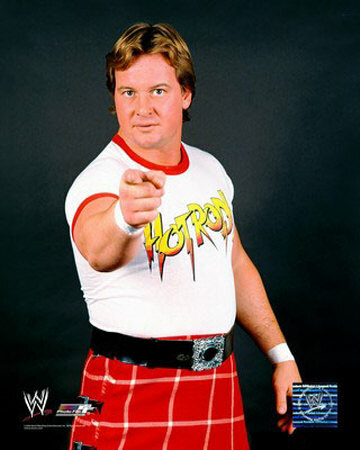 Hot Rod was my favourite, and I'd tune in weekly to hear him on the Piper's Pit. We all know "For Everybody" was the best track on The Wrestling Album. JYD, Jimmy Hart and Captain Lou contributed gems, but Hot Rod stole the show. The reason that line is in the movie is that Roddy gave the director a bunch of lines he'd said in wrestling 'promos' and they decided that line was a good fit ... good call. Of course, the late great Captain Lou Albano wasn't really Cyndi Lauper's dad. He just played the role in music videos and in the WWF. Well I was "worked" - I always assumed it was legit. This is the scene in the movie where I tell you wrestling is fake and something inside you dies just a little. Loved Hot Rod love his cameos even though he looks a bit scrawnier than he used to but geez he was one of the all time greats and easily my favorite wrestler of all time.